The first thing you notice when Windows Server 2012 boots is that it boots to the Server Manager console that enables administration and management of the server or servers in the environment. If you press the Start or Windows key on a keyboard, the Windows Metro style menu pops up. This might seem to be a simple cosmetic change to standardize the current look and feel of the Windows operating systems with other “Windows 8” operating systems like those for tablets, laptops, and desktops. Interestingly, with the release of Windows Server 2012, Microsoft did away with the Classic view of Windows (the Start button is no longer on the lower left, where it has been for years), so there are a few things to get used to. So, the seasoned Windows administrator needs a bit of time to get used to Windows 2012, but then it’s easy to find what you need. As much as there have been significant improvements in Windows Server 2012 under the hood that greatly enhance the performance, reliability, and scalability of Windows Server 2012 in the enterprise, Windows servers have always been exceptional application servers hosting critical business applications for organizations. Windows Server 2012 continues the tradition of the operating system being an application server with common server roles being included in the operating system. When you are installing Windows Server 2012, the Server Manager Add Roles Wizard provides a list of server roles that you can add to a system, as shown in Figure 1. Figure 1. 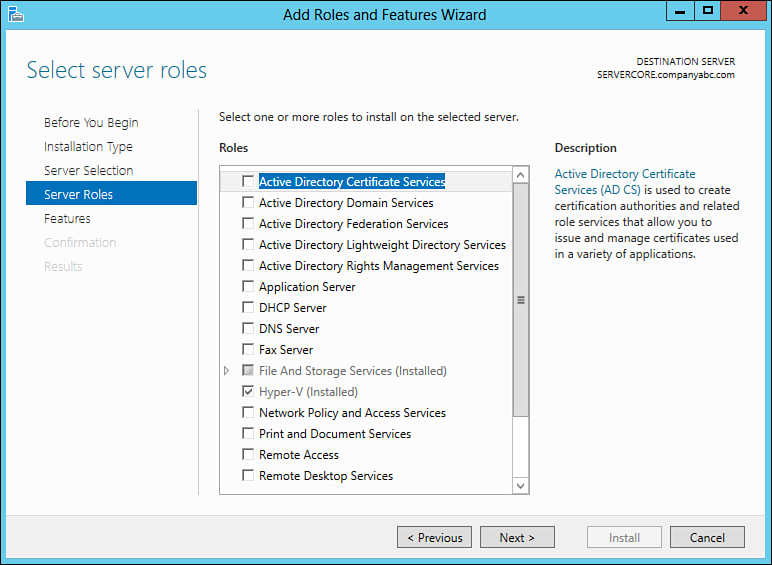 Server roles in Windows Server 2012. • File and print services—As a file and print server, Windows Server 2012 provides the basic services leveraged by users in the storage of data and the printing of information off the network. Several improvements have been made in Windows Server 2012 for file security and file server fault tolerance. • Domain services—In enterprise environments running Windows networking, the organization is usually running Active Directory to provide centralized logon authentication. Active Directory continues to be a key component in Windows Server 2012, with several extensions to the basic internal forest concept of an organization to expanded federated forests that allow Active Directories to interconnect with one another. • Application services—Windows Server 2012 provides the basis for the installation of business applications such as Microsoft Exchange, Microsoft SharePoint server, SQL Server, and so on. These applications are initially made to be compatible with Windows Server 2012, and later are updated to leverage and take full advantage of the new technologies built in to the Windows Server 2012 operating system. Some of the applications that come with Windows Server 2012 include Remote Desktop Services for thin-client computing access , utility server services such as domain name system (DNS) and Dynamic Host Configuration Protocol (DHCP), and virtual server hosting. Windows Server 2012 is also the base network operating system on top of which all future Windows Server applications will be built. However, Windows Server 2012 is more than just adding server roles and applications to the system’ some significant improvements of the server roles have helped organizations decrease the number of servers needed in the datacenter. A couple of the server role enhancements are Multitenant Internet Information Service (IIS) and Cluster-Aware Updating (CAU). Most people when they hear multitenant think it is something a cloud hosting provider might use to provide web services to a number of organizations. However, multitenant IIS can also be used to decrease the number of servers of every organization around. Multitenant IIS is the ability to take multiple instances of IIS web services and consolidate them into a single Windows Server 2012 IIS server. Unlikely IIS web services in the past, where most of the time you could not combine web services into a single host system, now with Windows Server 2012, a single host server can host 5, 10, 15, or 20 isolated instances of IIS. The single IIS server can front end SharePoint Web, Exchange Outlook Web Access (OWA), the corporate intranet, a handful of web apps, and the like. The consolidation of IIS web instances is done with the separation of rights, privileges, and execution operations. Multitenant IIS helps organizations eliminate several if not dozens of web servers and decreases physical server and license counts for guest sessions running small/thin Windows web services. Cluster-Aware Updating, or CAU, is a feature that assists organizations in failing over cluster servers to other nodes of the cluster so that another cluster node can be patched or updated. This functionality is not new to organizations, but what is new is the ability for Windows Server 2012 clusters to have built in to them the technology to be patch update and cluster aware so that when a cluster needs to be updated the core operating systems knows to fail over and fail back the cluster nodes. CAU technology simplifies cluster updates by automating the process to keep clusters up-to-date. • Active Directory Recycle Bin—The AD Recycle Bin was included in Active Directory 2008 and provides administrators an easy way to undelete objects in Active Directory. In the past, when an administrator inadvertently deleted an Active Directory object like a user, group, organizational unit container, or the like, the object was effectively gone, and the administrator would have to create the object from scratch, which would create a whole new series of security concerns for the new/unique object. The AD Recycle Bin now enables an administrator to simply run the recovery tool and undelete objects. • Global catalog cloning—In earlier versions of Active Directory, the only way you could create a global catalog (GC) server was to build a new server and let the data from other GCs replicate to it over the wire. This was fine for a small or mid-size organization because the global catalog typically didn’t have a whole lot of stuff inside of it, so it took a few minutes, maybe an hour, and everything was replicated. Even in large corporate enterprises, a GC server might take a few hours to replicate over a WAN link, but that is still well within typical acceptable tolerances. However, as cloud-based environments grow to include hundreds of thousands or millions of users, the replication time in multiple datacenters gets past typical tolerable limits. GC cloning in Windows Server 2012 allows an organization to take a GC, clone the information, and send the information to another site and recover the cloned server or information, and only changes (deltas) are replicated over the WAN. • Managed service accounts—Applications in a network frequently use service accounts associated with the security to start a database, conduct data searches and indexing, or launch background tasks. However, when an organization changes the password of a service account, all servers with applications using the service account need to be updated with the new password, which is an administration nightmare. With Active Directory 2008 R2 mode supported both in AD 2008 and AD 2012, service accounts can be identified and then managed so that a password change to a service account will initiate a process of updating the service account changes to application servers throughout the organization. • Authentication mechanism assurance—Another Active Directory 2008 R2 feature that is supported both on AD 2008 and AD 2012 is the enhancement of claims-based authentication in Active Directory. With authentication mechanism assurance, information in a token can be extracted whenever a user attempts to access a claims-aware application to determine authorization based on the user’s logon method. This extension will be leveraged by future applications to improve claims-based authentication in the enterprise. • Offline domain join—For desktop administrators who create system images, the challenge of creating images is that a system needs to be physically connected to the network before the system can be joined to the domain. With offline domain join, a system can be prejoined with a file created with a unique system credential written to a file. When a Windows client system or Windows Server system needs to be joined, rather than physically connecting the system to the network and joining the system to the domain, this exported file can be used offline to join the system to the Active Directory domain. These are some of the capabilities built in to Active Directory 2012, something that organizations can choose to upgrade AD or wait until an application requires an updated version of Active Directory to be in place before the organization updates their directory system.